At the base of health is the body’s largest organ: your skin. Skin is one of the most exposed organs in our body, facing constant weather and environmental conditions. While the caring for the skin in its entirety is important (don’t forget that body lotion! ), the face requires extra care and love. Whether you’re looking to start caring for your face or amp up what you’re already doing, skincare is all about establishing a great routine and habits. Of course it’s up to you how dedicated you want to be — all skincare routines are customizable — but the key is to stay consistent. Skincare is health care — hence why it’s in this issue — so treat it as you would treat healthy eating or exercise. The most basic thing to keep in mind is to cleanse every day! This means, no matter how tired, take that makeup off your face every night! I find that planning on exceptions is just a slippery slope. Plan to cleanse every morning and night — makeup-removing wipes are an absolute last resort. Cleansing also does not mean splashing around with water. Look for a product that cleanses thoroughly without stripping your skin. My favorite formulas are cleansing oils because they are incredibly thorough, gentle and moisturizing. Despite their name, they are suitable for all skin types. Other popular formulas include foams and milks. One of the biggest misconceptions seems to be how many people think they have oily skin. Some do, but in reality, many do not and are consistently stripping their skin dry. If your skin feels tight, flaky or isn’t an oil slick, consider that your skin may be at least a little dry. No matter the skin type, every face needs a moisturizer. It is not only for the moisture; it creates a protective layer from the outside everyday environment and helps prevent wrinkles and fine lines. Sunscreen is not just for the beach. It’s for walking to work, crossing the street, and sitting in the car. Most products make it easy to incorporate sunscreen these days so keep it simple by looking for moisturizer or makeup products with SPF. Gone are the days of thick, bad-for-the-skin foundation. The newest generation of makeup is full of benefits. Consider a foundation or powder that is oil-free, fragrance-free and/or contains SPF. If you can handle less coverage, BB cream is chock full of benefits including anti-aging ingredients, moisturizing properties, sunscreen, skin evening, and color correcting. I find that a BB cream with a full-coverage concealer, as needed, does the trick. If you suffer from dry skin, carry a moisturizing spray, spray lotion, or water in a spray bottle in your bag or at work. Spray it throughout the day for a thirsty skin relief. If your skin is oily, carry oil-absorbing sheets. Removing oil is a much better idea than layering more powder on top. Finally, make sure to drink plenty of water. Hydrating for the body and skin — talk about multi-tasking! Bedtime is the best time to take care of your skin. Not only are you makeup-free, your body works to repair itself extra-hard at night. Nighttime is a great time to lather on the products that don’t work during the day. Consider a thicker night cream instead of a moisturizer. 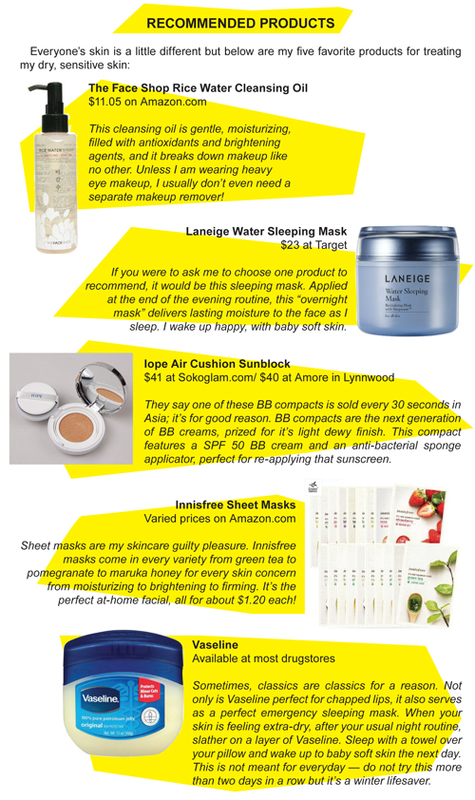 My other favorites include the occasional sheet mask and a sleeping mask or sleeping facial. It’s a great way to give your skin a bonus boost. Finally, don’t forget to get as close to seven to eight hours of sleep as possible.